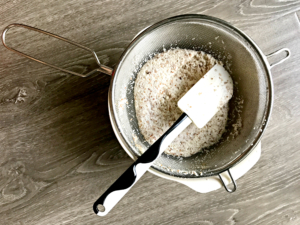 Whether you're lactose-intolerant, vegan, or just want an alternative to dairy, we've got the easiest recipe for almond milk ever here. You can start with the base and use any of our suggestions to spruce it up, but we're personally big fans of the pure version. First, you do not need a fancy blender or nutmilk bag. If you have these things, great! If not, just use any blender you have and a small-net strainer or colander. We love using a bowl that has a lip or spout to make pouring easier, but again if you do not have this it's alright. Use what you have, the most important thing is that you'll have your own fresh, homemade almond milk in no time! Keep in mind we are blending and straining the almonds, so the levels of these benefits will vary. With all the amazing components, overall almonds are great for lowering blood sugar levels, reducing blood pressure and lowering cholesterol levels. Bonus? They may even reduce hunger and promote weight loss. Soak almonds overnight or up to two days (the longer you soak them, the creamier the milk will be). In a bowl, pour almonds in and cover with filtered water (not the water you will use for the actual recipe. Make sure to still use the best water you have available as your almonds will be absorbing anything in the water IE: chemicals, flouride, etc. You can leave them covered with a light cloth on the counter or place in the refrigerator (the longer you plan to soak, the more appealing the refrigerator is). Why soak the almonds first? Soaking them helps to remove the layer of phytic acid raw almonds naturally contain, which inhibits the body's ability to absorb nutrients. *If you like creamier milk more like whole milk, use more almonds. If you like thinner milk more like 1% or nonfat, use more water. Drain and rinse the almonds. Separate the almonds from the water and rinse them under fresh cool water to rinse off any residue. Put your 2:1 blend of almonds and filtered water together. Place the almonds and water in your choice of blender. Blend. Start off slow and work your way up to the highest speed. Pulse a few times and then blend continuously, pausing to scrape any almond chunks back into the water. When you see the almonds are broken down to a fine meal consistency, you're ready for the next step. Strain. If you have a nutmilk/cheese bag, line your bowl with it. If not, put a strainer/colander in the bowl instead. 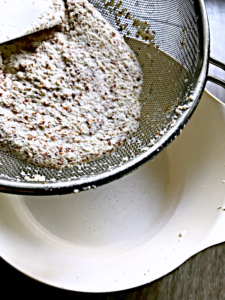 Pour the blended almond mixture into the strainer. Separate milk from the meal. With the bag, you will draw the mixture down to the bottom of the bag and twist at the top, squeezing with your hands to get as much liquid out as possible (It'll look like the frosting bags fancy cake makers use when icing a cake). The remaining meal in the bag should be quite dry and almost flour-like. With a strainer or colander, simply grab a spatula and press it down to get the liquid out into the bowl. Optional: Taste the almond milk, if you'd like to add some sweetness to it, some of our favorite options are: blend again with some figs, dates, cinnamon and/or vanilla. You can also just add some honey, agave, date syrup, etc. depending on your flavor preference. Refrigerate. 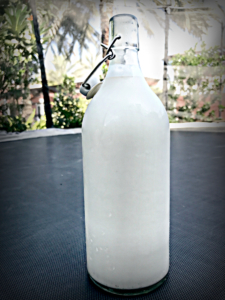 Fresh almond milk is usually good for a few days in the fridge, just make sure it's in an airtight container. Optional step: Sometimes you can re-blend and strain the pulp to make another batch of slightly less potent almond milk and end up with even finer meal. 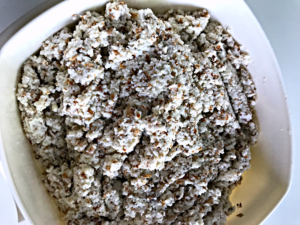 Check back in next week to see what you can do with the leftover almond pulp!